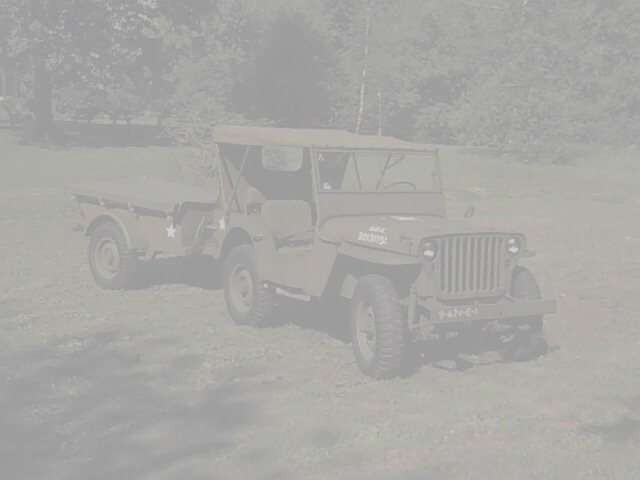 Here are some reviews from WWII jeep owners, potential owners, and enthusiasts. Received your WWII JEEP GUIDEBOOK recently and just finished reading it, most of the chapters twice..... Great book! I really enjoyed it! 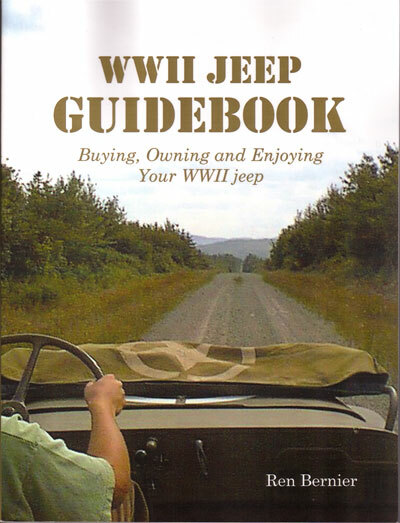 Your book has a wealth of information especially for someone like me, new to WWII jeeps... I learned a lot about the jeep both informational and practical (I don't think I would have ever figured out the "push/pull" headlamp switch without your book).... Thanks again...well worth the money; and thanks for autographing it....I will definitely recommend your book to both new and long time jeep enthusiasts. If you are new to the WWII jeep world, and have even a fleeting thought of buying a WWII jeep, then you must buy this book! I was someone who has always had an interest in WWII and WWII jeeps, but who was only recently in a position to actually buy and restore a jeep. I stumbled on Ren's book very early in my research, and it was a great buy! It was delivered within days of my ordering it. It was/is very readable (I read it cover to cover in one night), amazingly informative, and empowering. It gave me confidence that I could go look at old jeeps and know what I was looking at (a WWII jeep, an early civilian one, or just a bad imitation). It really help me organize my thoughts and goals as to what I was looking for (a show piece, a nice jeep for a parade and ice cream runs with my son, a previously done restoration, etc. ), and it was very helpful in setting my expectations as to the projects budget and timeline. I cannot recommend this book enough. It will pay for its self a thousand times over! Ren has answered all the questions about WW II jeeps that a newcomer should have, but hasn't thought of yet. It's also a great read for those that have been around jeeps for years. I "met" Ren here on the [g503.com website] several years ago. Then I got to really meet Ren at the 2003 National Convention in Alameda. I have always been impressed with Ren's knowledge and his ability to share that knowledge with others. He is able to do it in such a way you don't feel ignorant because you didn't know. Now Ren has combined his knowledge and his teaching skills to produce one of the best books aimed at the beginner and the "experienced" alike. My hat's off to you Ren...This is the book this hobby has been waiting for. This book is great, guys! If I had it ten years ago, it would have saved me a lot of time and money. If you're searching for your first WW2 jeep..buy this book first. If you've already aquired your first WW2 jeep and don't know where to start..buy this book. If you have been in the hobby for a long time...buy this book anyway..I'll bet you'll find a few things you didn't know. I got my copy yesterday! Thanks Ren! I've gotta say that this book eclipses the All-American-Wonder set as the recommended "first buy" books on my personal reference library review list. Ren's website was a big influence in the decision to enter the jeep restoration hobby. I consider myself a very experienced car restorer and find the advice Ren gave on his website and now in this book as dang righteous! Accurate, insightful, packed with detail and very real-world based. If your goal is to restore a WWII jeep and do it logically as a good investment as well as emotionally/romantically by preserving a piece of history, Ren's book has the answers to the questions you're going to have. Your book is just the right mix of technical facts, how-tos and history, with your personal experience and advice. Its got the kind of info we all sought as we were getting started in the hobby...and its got the kind of info we seek now that we are up to our elbows in axle grease. Its well put together, fun, and helpful…. It was a pleasure reading the WW2 Jeep Guidebook written by Ren. He has done a nice job of covering all the topics of jeep ownership. One place that could use some further investigation is the claim that WW2 6.00x16 tires were limited to "V" shape while the "rounded" in are post war. Photographic evidence doesn't tend to support this. ... In fact, the manual on tires written during WW2 clearly shows the type tire picture on page 20 as "the tread pattern with rounded notches...commonly found on modern reproduction NDT tires." At any rate, its not a big deal and doesn't seriously detract from the book. Looks like great advice on buying a jeep, what to look for and look out for. Hey! He even says some stuff about paint! And I can agree with him on it! How about that! All around a great book. Everyone should get a copy. I suggest that this is infact the first book to get (over the time honored All American Wonder Vol 1 and 2) when getting into the field of jeep study and ownership. There is a flaw to the book that should be mentioned. The pictures are a tad too dark. This doesn't help the book any and the printer should have caught this. However, there is a ton of information that will help anyone interested in buying a jeep and you certainly can tell what the picture is--it just could be a bit brighter. Absolutely dead on righteous book. I have read it and found no real glaring issues or controversial things mentioned. It is really the book we have all looked for when we first got into the hobby. I only wish I had this to read before I came on www.G503.com, ‘cause then I would have had some ... [info] to work with. It is a fantastic guide for all WWII jeep enthusiasts as well as a must buy for those individuals new to the hobby. It has superseded All American Wonder Vol #1 & 2 as far as I'm concerned. The familiar writing style is nonjudgmental and leads the reader into the WWII jeep hobby, giving enough information to bring them out of the uninformed to someone who can say he can at the very least converse with others on the topic. Unlike other books with just photos or without a real format Ren shows the process of finding, buying, restoring and owing a jeep. Loved the parts about how to transport and show a jeep. One area that will sure be a help to all are the sections of the Appendixes pertaining to the Restoration Cost and Journal. All those questions on what to do and when to do it, what will it cost and how long will it take to do are right there in black and white. ... the book flows with the facts in a way that makes it a must buy! This IS the definitive "First" book to buy if you want to learn about or buy a WW2 jeep ... Ren's writing style encourages those who want to learn more to go out and read other in depth or diverse writings such as the "Rifkin Report", "AAW1", "AAW2" yet points out enough nuances and differences about the jeep for the casual reader. I have to confess that I know Ren. We met by exchanging e-mails on the "G" and we finally met in person a couple of years ago at the MVPA Alameda National Show. Ren is a real kick in the head, all around good guy and easy to like. So when he mentioned a few months ago he was doing a book and would like me to give an "honest" review, I was flattered yet concerned that it may be the same regurgitated story of the jeep. My grandma taught me a long time ago,"if you can't say anything nice to not say anything at all". Well grandma doesn't have to worry and neither does Ren. The book "WWII Jeep Guidebook" is way better than expected and to be quite honest superlatives do not begin to describe the very useful information contained within. One last comment for you guys (and gals) that have been into jeeps for umpteen years and don't want to buy another jeep book, you will enjoy the read and YES, you will learn something you didn't know before! So in closing all I can say is: BUY THIS BOOK! What a book!!! It should be the required textbook for "JEEP 101".